NanoGraphene produces ultrapure water-based concentrated graphene paste for industrial and research applications (NG348-0009P-W). 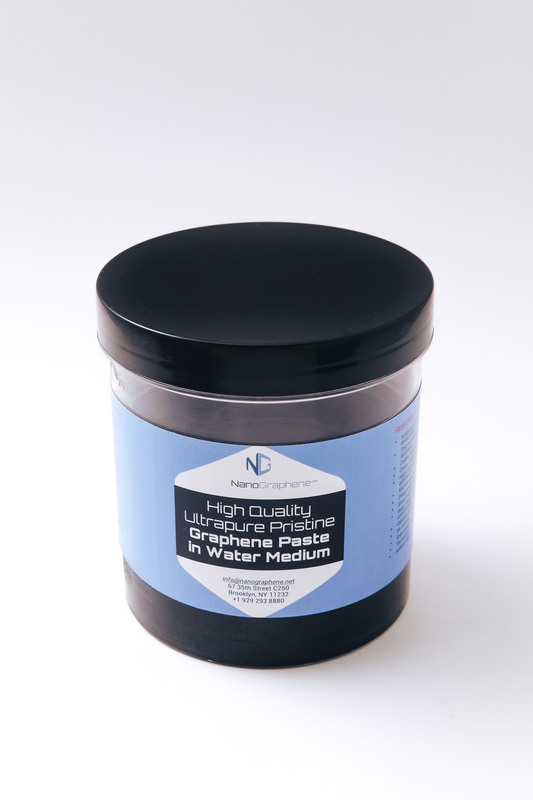 The concentrated graphene paste is made from high quality defect-free unoxidized pristine graphene sheets that are produced by mechanical exfoliation. We produce graphene pastes in various flake sizes and product properties can be tailored depending upon the customer’s requirements. We provide a Certificate of Analysis and Product Specification Sheet with this product. This product can be diluted and dispersed in water or the desired solvent mixture via one hour of ultra-sonication. This product is suitable for water-based applications development. This product can be mixed with a water-based polymer or rubber matrix using a high-speed mixer or high-shear mixer. We will provide further instructions upon request. If you require more info, contact us.